Game may crash when using Alt+Tab ↹ during loading screen. Further patches can be downloaded here. Multi-monitor HUD: Position Affects Gameplay. Tags scientists and explosive buildings. 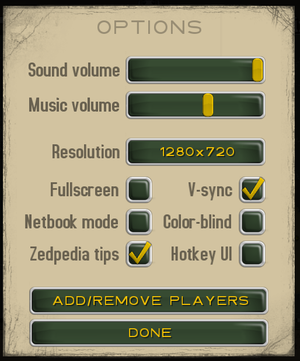 Menu responds only to Player 1, who uses a mouse. Can't remap to LT or RT on XInput controllers. Mutes and activates pause menu. From the dropdown box, try using Windows 7 and Windows XP (Service Pack 3) options. Sometimes updating graphics card driver to the latest version could help.